Student Reader includes decodable text, controlled for phonics and sight word knowledge. Student Workbook provides extended practice and reinforcement for the decoding and comprehension skills presented in the Reader. 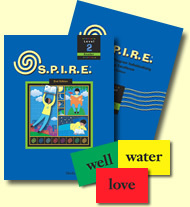 Teacher’s Guide contains scripted, explicit lessons for teaching every concept in the S.P.I.R.E. scope and sequence. Blackline Masters include materials for teaching Key Word Concepts, Concept Mastery Fluency Drills, and for assessing phonics skills and word identification. Manipulatives for Demonstration and Drill include sets of phonogram cards, letter sets, word cards, and a magnet board with magnetized Sound Circles and Syllable Rectangle for the Phoneme Segmentation activity.